Abrar Hussain: Chief Election Commissioner KM Nurul Huda announced yesterday that the Army will be deployed in the upcoming general elections but not during the upcoming city polls.He said the Election Commission is thinking of solutions to ensure that the irregularities that took place during Khulna City Corporation (KCC) polls are not repeated. 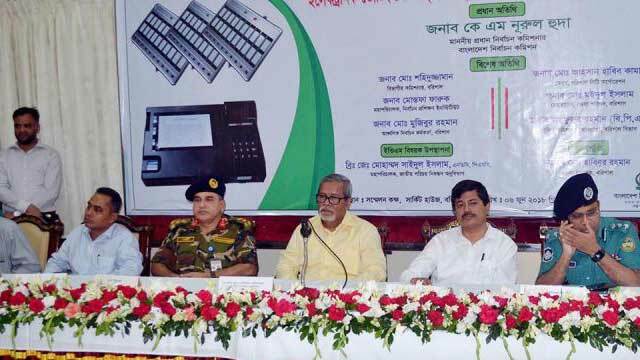 CEC Huda made the announcement while addressing a press conference after a two-hour training session for the election officials of Barisal and Faridpur zones over the use of Electronic Voting Machines (EVM). The CEC further elaborated that any special initiative in requesting any particular party to join the upcoming election will not be taken. According to Huda, city corporation elections in Gazipur will be held on June 30 and elections to Rajshahi, Sylhet and Barisal will be held on July 30, ahead of the next national polls.